Ya , I think I am addicted to internet and blog. Its been a part of my everyday life. Such that if I sleep without cheking my mails and some sites at night, I feel I have missed out something that day. What to do? Aadat se majbur. So right now, I will tell you some of my experiences of my mumbai visits this year . This year, you can say has been one of travelling year. Though I can say that I have not travelled that much , but still what do you tell of a person who does not go out of his city that often and all of sudden , he is let loose on his own to do things he wants to do? thats what is happening to me nowdays.. Suddenly and unexpectedly, I am travelling . 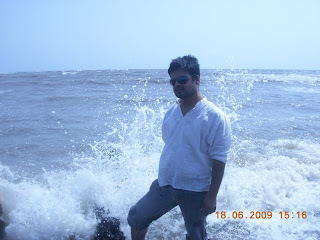 My first visit to Mumbai after so many many years was approximately in august 2009. I had last visited it when maybe I was begginning to come in my teen years. I was going to pay a visit to my cousin who was working there and was calling me . I was having a pre impression of mumbai, that it is a noiseless city infested with careless people having attitude of " I don't care a damn" and with "bhai log". and a crowdy city and some more. But to say that only 2 of my pre conceived notions came true. Rest may have been overlooked or ignored by me or may not have been in my luck to see. I stayed in one of Mumbai's silent area called goregaon ,infested with malls every 10 meters. Though it was among malls, it was still silent . The first time I stayed in west area crowded with malls and other shops, second time i stayed in east area, which I was surprised to find was filled up with a semi jungle area and some hill station type of view . wow... was i dreaming?! trees in Mumbai? But that was true. Ok so you might be thinking that we might have been roaming around in mumbai the most of the day and drinking away. No, wrong. I stayed there for around a week , and to say the least we never actually traveled during the daytime. Only after noon, we did think of going out. and why? Because my too good great brothers slept up til noon while, I idled away on tv and net . what can i do? I cant sleep more after 7 am at the most. Such sleeping energy, people have got. We traveled in mumbai's luxurious local transport system. Yes, am talking of local trains. hoards and hoards of guys come out and in of each local trains daily . it is a miracle as to how the guys there manage to have the local trains on time each day. You don't have to worry about going in or out. Just stand there facing the direction you want to go , and you will get there automatically with 50 people behind you pushing you out or in. But it did give me fun to travel in local trains such that i actually looked forward to it every time. And it also provided me enough practice to actually get some space inside before I would come there again.I think, the local trains should be awarded some award of some type of best public transport system or something. the local trains have improved much much compared to before. Well, we travelled to usual places there , that is juhu beach, gateway of India, Marine Drive , etc, and yes would the journey be complete without seeing the house of the superstar of millenium Mr Bachchan?. Just sad that didnt get to see him . The pigeons at india gate are a site to watch. They have formed a practice to take grains from your hands. Great. Atleast they teach people to trust each other and be innocent . Some lesson to learn. What do people do when they have had a heavy lunch in a restaurant and then go out for a stroll at juhu beach in evening time? Of course, get wet and eat some pani puris and light weight. But here also, me and my brothers started ordering heavy cheese pizzas and other stuff. People also do have heavy capacity to eat anything , anytime. And like i said , Mumbai is filled up with malls and malls, so off we went to the nearest mall within walking distance of our place. the Inorbit Mall. I learned recently that it is the biggest mall in India. Well not surprised, but yes, among all the malls I have seen, this mall has been my favorite to haunt. Go and visit this mall once if you want some more each and every time but yes with enough bucks in your pocket. Other great place to visit is Haji Ali dargah. The place is situated right in the middle of the sea we can say. But as you enter from the crowd and noise of the city to this Dargah, you experience a quite serene peaceful atmosphere . you feel such peace inside that you would always like to stay then and there. Like I said Mumbai is nice city to live in but only if you have enough bucks in your pocket ,otherwise the City does not care who you are even if you are some son of a influenced person also. Money is what matters the most. Next time , i will write my experiences of the people there in my second part. see you guys soon. Well...what to say about Mumbai...it rocks always...No matter how much you suffer, if you are a Mumbaiyya, you will be proud of that..and what to say about local trains, they are lifelines of Mumbai.